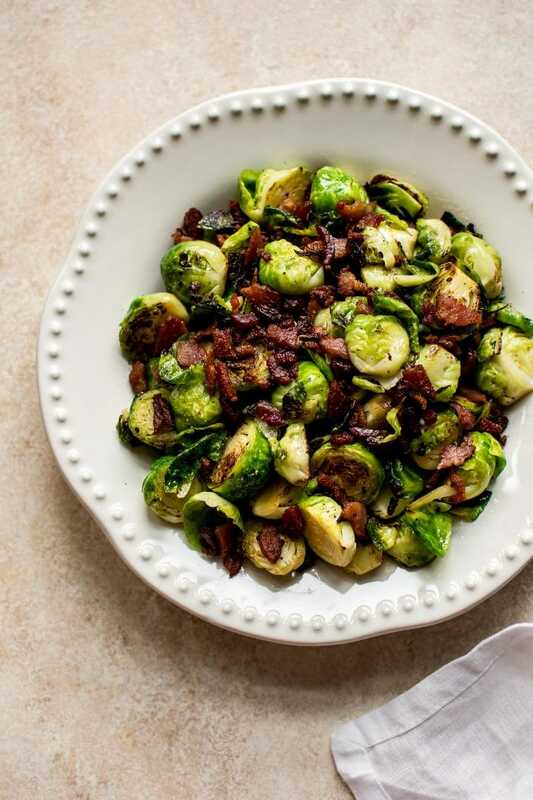 This Brussels sprouts and bacon recipe is a super delicious 2-ingredient side dish that the whole family will love. It’s easy and fast. 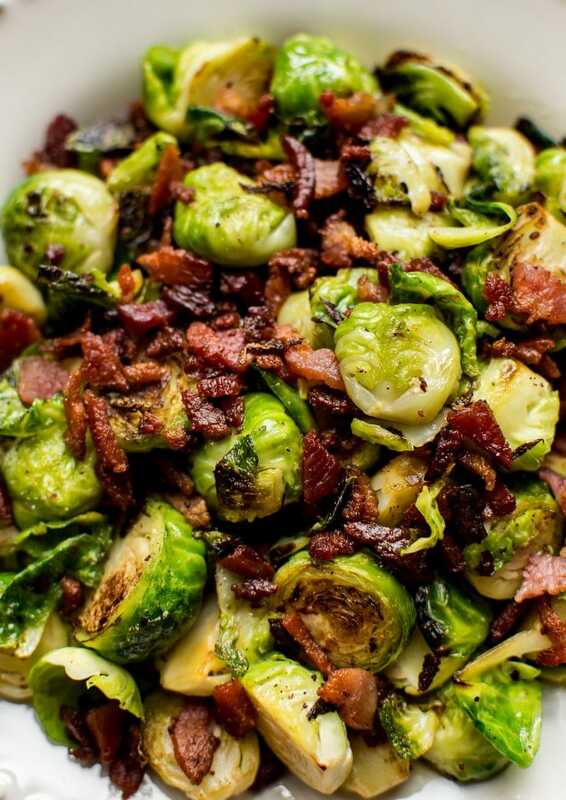 Bacon and Brussels sprouts just go together. This simple side dish is definitely worth making. I’m a big fan of just plain ‘ole Brussels sprouts, but dressing them up every now and then is good as well. I have a few more Brussels sprout side dish recipes on the blog, including my maple pecan Brussels sprouts, my creamy baked Brussels sprouts, and my shredded Brussels sprouts and kale salad. Brussels are definitely one of my favorite veggies, and they’re good cooked or raw. In unrelated-to-this-recipe news, my interview for the Dishing with Delishes podcast went live on Wednesday. If you’re interested in hearing my voice or getting to know me a bit better, have a listen. 🙂 I talk about growing the blog and how Salt & Lavender was named (among other things). I cook the Brussels sprouts in the bacon fat for extra flavor. Brussels sprouts can be a bit tough, so the first part of the cooking process is done with the pan’s lid on. This traps the steam and cooks them faster. I keep the heat relatively low so they don’t brown too quickly. You finish the cooking process with the lid off and then brown them even more to your liking if you wish. I used small-to-average size Brussels for this recipe. If you use larger ones, cooking time will need to increase from what I suggest in the recipe. This side dish is the perfect accompaniment to a roast (chicken, beef, or pork), or even a Thanksgiving turkey. It goes with pretty much any fall/winter main course in my opinion. I hope you’ll give this easy Brussels sprouts side dish recipe a try! Questions? Let me know in the comments below. 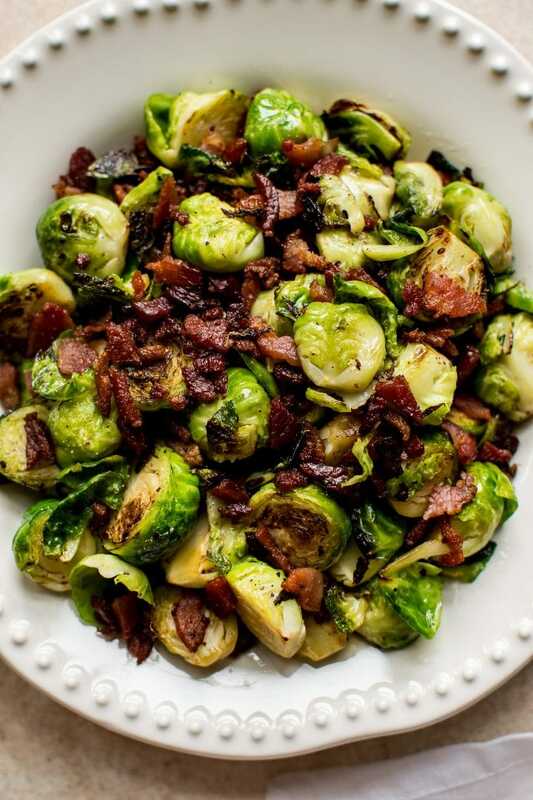 This Brussels sprouts and bacon recipe is a super delicious 2-ingredient side dish that the whole family will love. It's easy and fast. Fry the bacon in a skillet over medium-high heat until crispy. Take the bacon out of the pan (set aside until needed) and leave the grease in there. Add the Brussels sprouts to the pan, stir them until they're nicely coated in the bacon grease, and cover the pan with a lid. Reduce the heat to medium-low. Cook for 5 minutes. Add the bacon back into the pan. Cook, uncovered, for a few more minutes or until the Brussels sprouts are as tender and/or browned as you want. You can cover the pan again if you wish (especially if you want the Brussels to be super soft); just keep an eye on them so they don't scorch. Season with salt & pepper if needed. Serve immediately. I used small to average size Brussels sprouts. If you use giant ones, cooking time will definitely need to increase. What a great combination. I love that you’ve got so much bacon in there.